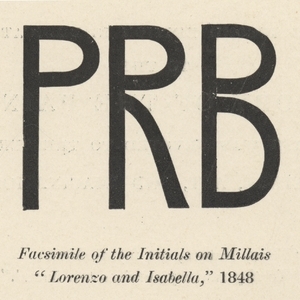 Facsimile of the Initials on Millais "Lorenzo and Isabella"
A facsimile of the initialism 'PRB' as written originally on John Everett Millais' painting, "Lorenzo and Isabella" from 1848. The initials stand for Pre-Raphaelite Brotherhood. William Holman Hunt, "Pre-Raphaelitism and the Pre-Raphaelite Brotherhood." 2 vols. Facsimile of the initials on John Everett Millais' "Lorenzo and Isabella," 1848. Millais, John Everett, 1829-1896, “Facsimile of the Initials on Millais "Lorenzo and Isabella",” UVic Libraries Omeka Classic, accessed April 23, 2019, http://omeka.library.uvic.ca/items/show/1579.